File photo of Alan Browne. AMONG THE REASONS Mick McCarthy named a bloated 38-man provisional squad for the upcoming Euro 2020 qualifiers against Gibraltar and Georgia was as an insurance policy in the event of injury. It is proving wisely – and unfortunately – pragmatic. With a freak gust of wind causing Ronan Curtis to lose the top of his finger yesterday, Preston midfielder Alan Browne was tonight substituted midway through the first-half of their 2-1 win at Middlesbrough through injury. His manager Alex Neil admitting the injury is a point of concern for the club. 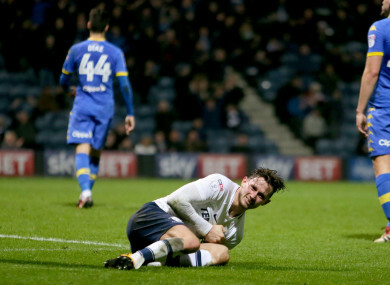 Elsewhere, Sean Maguire completed 90 minutes for Preston, although Callum Robinson didn’t even make the bench as his comeback from injury is measured in tentative steps. Elsewhere, Norwich City returned to the top of the table with a 3-2 win at home to Hull City. The Canaries are two points clear of second-placed Leeds. Martin O’Neill’s hopes of guiding Nottingham Forest to the play-offs upon his return took a blow with a 3-1 defeat at home to his former side Aston Villa. They lie tenth, although still just three points from sixth spot. Derby County – the side in that final play-off place – drew 0-0 with Stoke while West Brom sloughed off the firing of Darren Moore with a 3-0 win against Swansea at home. Millwall beat troubled Birmingham 2-0 at St Andrew’s, and Rotherham beat QPR at Loftus Road 2-1. Email “Alan Browne limps off as injury problems begin to mount for Mick McCarthy”. Feedback on “Alan Browne limps off as injury problems begin to mount for Mick McCarthy”.